The protagonists of course didn’t know the details of the others’ plan. 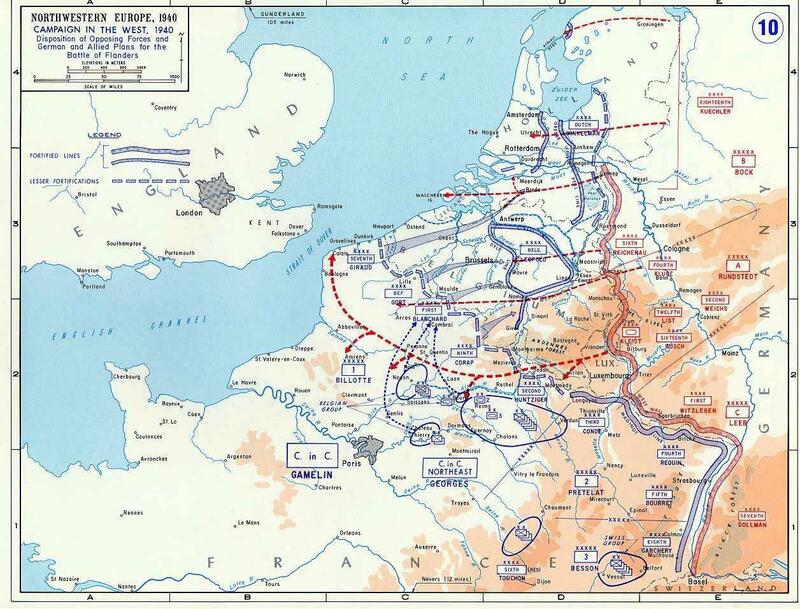 When the offensive started on May 10th, the first concern for the Allied forces was to win the race to their prepared positions and be in place before the Germans could mount a strong attack. For this they counted on strong resistance by the Belgian army in their frontier fortifications built around the Liège fortress and the Albert Canal. The Germans for their part wanted to overcome those same frontier fortifications as quickly as possible and disrupt the movement and retreat of the Allied forces. Just like further south with the Meuse, a “race to the Dyle” ensued. The theater of war. Open in new tab to enlarge. The Allied race was not some impetuous charge of the light brigade. There was a detailed movement plan, which had been worked out over months of planning. It made extensive use of the Belgian rail network to bring the infantry divisions into their deployment areas. To cover this deployment the Allies sent out reconnaissance forces to scout ahead and make contact with the lead forces of the German spearhead. It is here that we see a difference between the BEF and French approach. BEF sent out 12th Lancers, a mechanized regiment consisting of 38 armored cars, in a traditional scouting and recon role. They raced to Leuven (Louvain) on the 10th of May, and linked up on the 11th of May with Belgian and French troops to form a screen. The Lancers ade contact with the enemy the next day and proceeded to retreat back while maintaining contact with both foes and friends on the 13th, allowing bridges to be blown, plugging gaps as they threatened to appear to avoid infiltration, and passing back through the front line on the 14th with minimal losses. They passed into GHQ reserve, available for subsequent use as can be seen in Road to Dunkirk. Well done chaps! The French on the other hand sent out the whole of Prioux’s cavalry corps! This clearly was a recon mission of a different kind. Rather than just gain information and screen, they were there to blunt the German spearhead, and following that retreat behind the main front line. This was in my opinion a serious error of judgment, as in doing so one of the Allied armies’ best units was sent out into a quite exposed position and would (and did) incur serious losses and much disorganization. And while the corps did accomplish much of its mission in the battle of Hannut on the 12th and 13th of May, it retreated badly mauled on the 13th, passing behind the front of the French 1st Army on the 14th, never to be used again as a coherent force. The consequence was therefore that by Day Four of the offensive, probably the best corps of the French army was out of action and no longer available as a reserve for counterattack. While the recon units were out in front, the movement plan for the main body went into motion like clockwork. The area we are particularly interested in is the area between Brussels, the town of Wavre about 30 kilometers southeast of Brussels and 20 kilometers east of Waterloo, and Waterloo itself. The area of Wavre and north of the town was assigned to the BEF and in particular I Corps, which consisted of 1st Division, 2nd Division and 48th Division. Second Division was assigned the town of Wavre and the area immediately to the north, with 1st Division prolonging the line further north. Forty-Eighth Division was placed in reserve and would arrive later. The first elements of 2nd Division to arrive on the scene, at around 17.30 on 10th of May, were the lead elements of division’s own recon troops – 4/7th Dragoon Guards. These were followed the next morning by 4th Brigade and in the afternoon by 6th Brigade – both assigned as front-line units for this sector. While the lead brigades started occupying and further readying the prepared positions, late on the 12th of May 5th Brigade arrived and set up as the reserve formation of 2nd Division. The River Dyle at Waterloo, 2016. Simultaneously south of Wavre the French forces were arriving. The area immediately south of Wavre was assigned to the elite 2nd DINA (Division d’Infanterie Nord-Africaine). It consisted of the 11th Régiment des Zouaves, 13th Régiment des Tirailleurs Algériens and 22nd Régiment des Tirailleurs Algériens. Unlike the BEF, which was pretty much motorized, these units arrived mostly by train. The lead battalions of 11Z and 13RTA arrived in the late afternoon on the 11th, with the main body arriving on the 12th and the last elements of the 22RTA, arriving on 14th of May. These too were set up in depth, two battalions in the front line with one battalion in reserve. The German advance began in the area around and north of Aachen – about 140 to 150 kilometers from Wavre. Lead elements of XI Corps started arriving in front of the Dyle by the end of May 14th, where they stopped upon discovering the position to be firmly held. That day the Luftwaffe had also bombed Wavre. During the night of the 14th the main body arrived and installed itself facing the BEF and French. They had covered the distance in about four days! Considering that an infantryman on foot covers about five kilometers an hour during eight hours (that is, about 40 kilometers per day), this means that all the Belgian and Allied operations had slowed them down by about one day, when compared to just walking the whole distance – a truly remarkable performance. Even so, they did not have a hope in hell to get to the Dyle first. The race was not really a race at all . . .